I know… I know… I should have posted days ago. But the holidays are here! And I am in Oregon visiting family! Having martini lunches and wine tasting! Visiting my Grandma and Mama and Aunts and Uncles… So, I will get right to it, so I can get back to enjoying my last few days! For Christmas Eve we hopped on over to my Aunt Candy and Uncle Bills house… champagne and snacks abounded. And then back to my moms (where we are staying) for a lovely evening meal. Christmas morning we made brunch- popovers were on the menu which is one of our all time faves… and then to Uncle Ray and Aunt Annas for a prime rib Christmas dinner. Ahhh- the food!~ The fun! 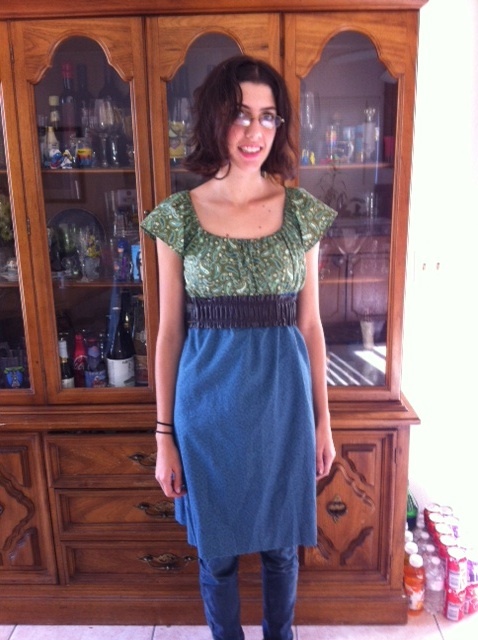 First up- here is Kadi in the vintage dress. It is black velvet and has a tulle slip. I absolutely LOVE the scalloped neckline and want to recreate this. Isn’t the back divine? Holly wanted a green dress this year. 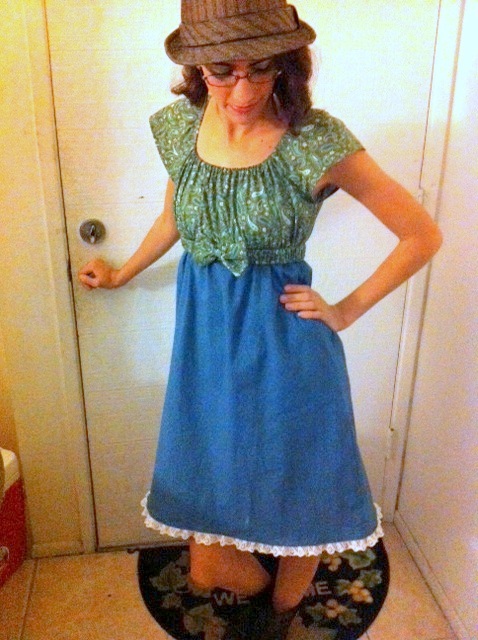 I used Simplicity 2305- a Cynthia Rowley design. 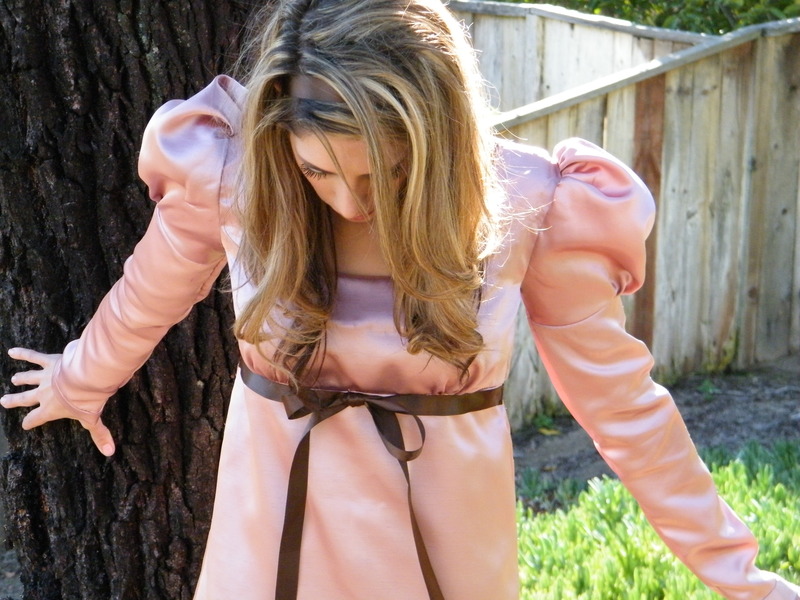 I love the sleeves… I love the crepe backed satin I used… I didn’t love the fit of the bodice. Holly is difficult to fit- she is sooo tiny. I am thinking of trying a petite pattern on her. The bodice is a little loose but she is happy and I am happy! 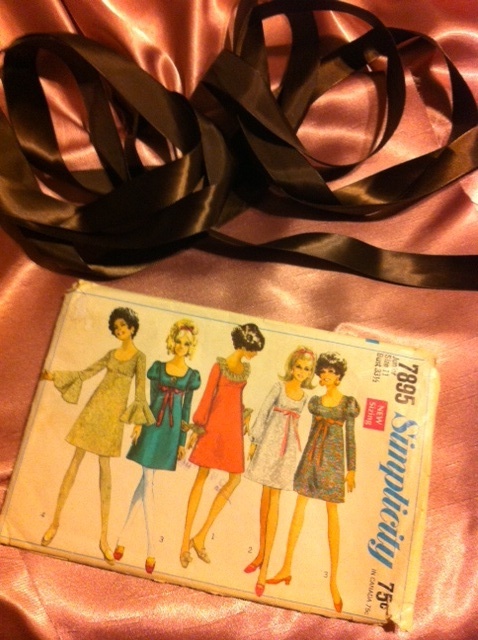 I think if I do this again I will make the neckline a little less deep. And Juliette’s dress- The ultimate fail- although when I get home I am going to try and save it. I waited until the last minute with this one. The fabric is GORGEOUS and one I thought would go well with her coloring. It is a gold and creme lame. I picked a simple pattern BUT it is home and I am here so I will have to add it later! What this dress REALLY needs is some fitting and a GOOD ironing on a low temp. The seams are pulling. SO – although I would only like to share my magnificent triumphs- I will share this dismal failure. Yes- a good pressing and a little fitting and MAYBE she will wear it again. Last but not least- here is Eleena’s Holiday finery. Kerrielee used a white cotton and although it is difficult to see there is red tulle peeking out. Next year I get some holiday finery!! Selfish sewing in 2013! Can I hear a ROAR? 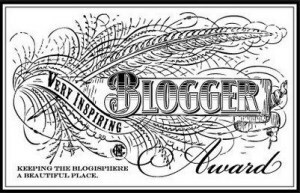 As a newbie blogger, I have found the blogging world to be fun, supportive and inspiring. I love reading what everyone is up to, seeing what they have made, drooling over recipes, and I can honestly say I learn something every day! AND I love to see the “challenges” and sew-alongs and pattern pyramids and well, it just seems like a wealth of sharing and caring goes on. So, I am in… my cousin is in… And frankly I can’t WAIT to see what everyone stitches up. I have to admit I have already been frantically combing through my stash to find an appropriate meow.. or maybe a growl… Now I just have to decide who I am going to make it for and what it will be! I wanted to make something simple but sweet for Holly. She is my middle daughter, 17 years old and a senior in High School. She loves theater and plans on making a career of it. She is not afraid to wear anything, does not care what people think, and can usually be found wearing a hat of some sort! Be yourself and wear what makes you happy. That describes Holly! Holly- 3 years old and always smiling! I have been on a tight budget recently, and frankly have spent the last 10 years sewing a whole lot more quilts than I have clothing. A lot of my stash is quilting fabric or flannel- although I have some fashion fabric. I stumbled on the olive green paisley cotton in my garage and searched high and low for a cotton that would contrast nicely. The one I found I think I have been stashing for 10 years! But it looked nice with the green. 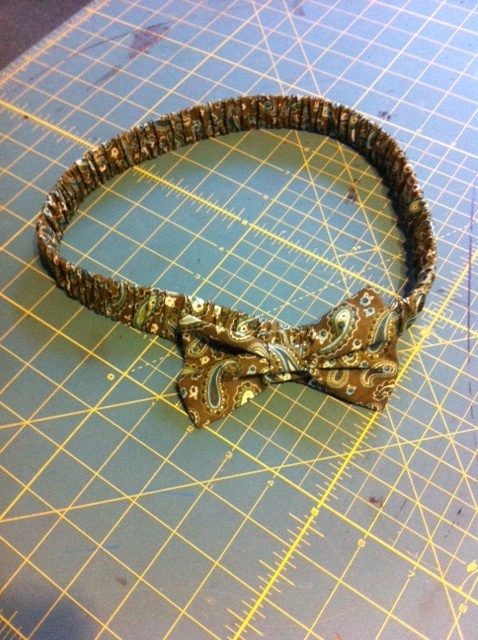 Here is the belt… As you can see it is simple but works perfectly. I used a large snap at the bow so it can be taken on and off. I think it is the perfect touch! Please excuse the pictures- I promise I will get better at the picture taking part! 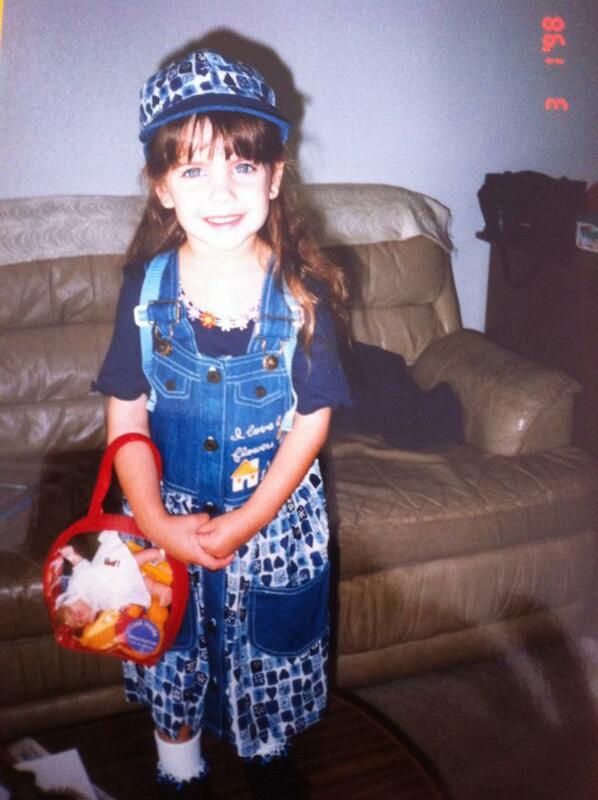 Holly LOVES her dress. She plans on wearing it tomorrow while she feasts on Thanksgiving Dinner. Speaking of which- Have a safe and Happy Thanksgiving Holiday! The finished dress in all it’s glory!